In the Southern Ocean, the primary production is light and nutrient limited, iron being one of the main limiting factors. Unfortunately, iron is mainly present in the deep layers of the ocean, nearby topographic obstacles (Klunder et al. 2009), where the absence of light prevents photosynthesis. 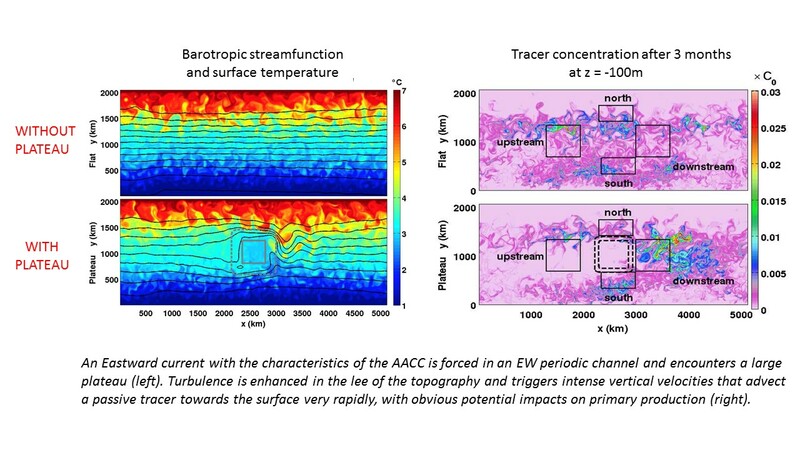 This work aims at investigating how topographic obstacles on the path of the Antarctic Circumpolar Current (ACC) may disturb the flow and lead to significant upward vertical velocities, capable of uplifting iron towards mid-surface waters. We first considered an idealized numerical configuration of the ACC, similar to the set-up of Abernathey et al. (2011). It consists of a zonal jet in an east-west periodic canal. We used the Regional Modeling System (ROMS) with 70 vertical levels and varied the horizontal resolution from 16 km to 8 km and 4 km. The zonal jet has the basic dynamical features of the ACC, i.e an intense zonal current with a strong barotropic component. Barotropic and baroclinic instabilities of the density front sustain an energetic mesoscale eddy field in the first 1000 meters. When the flow encounters a large scale « plateau », it is mainly deviated northward. Meandering and reorganization of the flow in the lee of the topography triggers a very energetic mesoscale eddy field all over the water column. Enstrophy is enhanced in the lee of the topography at all depths, so as the probability of having vertical velocities higher than 10 m/day. The latter are responsible for the upward injection of a tracer from depths as below as -1500 m towards the surface layers in less than 12 months. Below the mixed layer, for such large-scale smooth topography, vertical mixing processes play little role in upwelling the tracer to the surface. Collaborations: P. Monteiro (CSIR), C. Reason (UCT), N. Kobo (PhD candidate), J. Collin (PhD candidate).